This bed time and quiet time audio program for autism is designed to work on a subconscious level and uses metaphorical story techniques, visualizations, positive affirmations, special frequencies, and music to assist with more positive internal processing and environmental responses. Each title in the program targets a specific area of concern for common autistic children and when used as a program, provides a holistic approach to better cope with autism in day to day life. Because the program works on a subconscious level while they sleep, the new patterns, ideas and processes that are taught to the child through positive metaphorical stories are more likely to become a part of their daily thoughts and actions. This means the program can literally change the way they approach dealing with different situations in their life and move beyond frustration and self-confidence issues relatively easily. Embedded into each MP3 story is a classical music background that was structured in accordance with the many scientific studies proving a positive relationship between musical therapy and autism. The music is designed to calm and relax the child and help them achieve a deeper a more relaxed and comfortable experience. This is furthered by the use of Neurosonic Frequencies embedded within the audio - which are proven through the use of Electroencephalogram (EEG) to create a theta brainwave resonance state to help calm and relax the child. Simply put, these frequencies are a combination of an exact theta rhythm and an F Sharp monophonic tone and they help to synchronize the brainwave resonance into the theta state. These programs were developed and recorded by Rick Collingwood, a leading international authority on hypnosis and mind-body communication techniques. Rick has worked with many children and adults who have Autism and Aspergers Syndrome. Many have experienced some incredible results using the same techniques that are recorded on to this program. This phase of the program talks about the importance of persistence and working towards the goal of understanding and being educated. It can help a child develop more of a commitment to furthering their learning experiences without getting frustrated or unmotivated. It will teach them that it is fun to learn and experience new things and the importance of paying attention in class or when they are being taught something. It uses strong visualization techniques specifically designed for children with Autism to absorb more easily. This audio program will help children with autism integrate into a conventional school and develop a willingness to learn and hence reduce their limitations in life. This bed time audio program uses visualization techniques, specifically designed to appeal to children with autism and most importantly, to create visual connections for better auditor and verbal responses. This is a similar approach to how therapists and child psychologists use pictures and signs to help create links between words and their meanings, except that the visualization is achieved through deep relaxation communication techniques inside the child's mind. This helps create more sustainable new neurological pathways and methods of better understanding what people are saying to the child. Using the 3 MP3 titles is simple. Just download each title and put them onto an Mp3 player, play the though a computer or even urn them to a CD. Play the audio at as comfortable volume for the child just before they sleep with headphones or through a stereo. Alternate between each MP3 every night for 6 days, then on the 7th day take a break and do not use any Mp3. Repeat this for 8 weeks and thereafter you may continue to use the Mp3s if desired or if you feel more reinforcement is needed. Through extensive trials and customer feedback we find that about 90% of children begin to love listening to the stories each night and after a few days will even keep asking each night "put on the story please"
It is fine and actually beneficial for them to fall asleep with the MP3s on. It is also fine to use more then 1 MP3 per day - perhaps your child has some an hour quiet time during the day when they can listen to a story - this can be fast track the progression in many cases. Just try to make using the story of a night time a regular and scheduled occurrence as children with autism respond extremely well to regular patterns and schedules. I want to personally thank you, years ago I had regular appointments with you in your suite in Brisbane for hypnotherapy and you helped me on so many levels, when you released your CD's etc I purchased them and have been using them regularly, after what results my family and friends saw, my friends have used them, my husband uses them and my mildly autistic son uses your current children's Cd's. I am so amazed at the results from these I am considering enrolling in one of your courses in the near future so I may be able to help children with learning difficulties and special needs within the school I teach at. 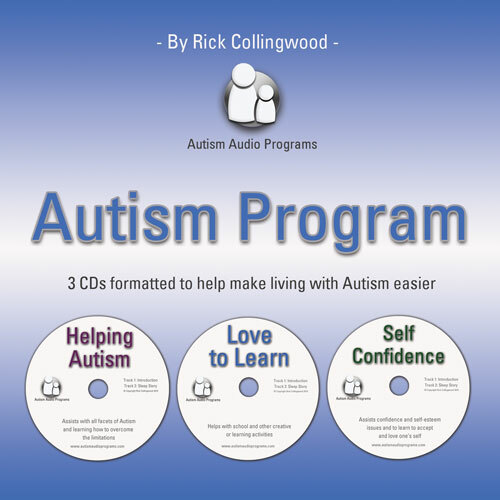 To receive your email announcing the release of your Autism 3 part audio program was like winning lotto to me, I know what results we have achieved with our son from using your other cd's so I can only imagine what the new release might do for him. Please keep up your amazing journey you are helping so many.